These are placed in order of quality from left to right; we'll detail each print below. 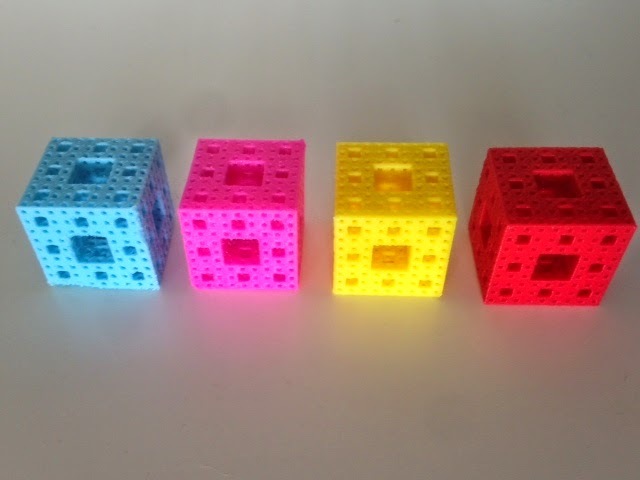 The model we used was a base-repaired version of owens' game-changing, support-free Customizable Menger sponge model. It's only 26 millimeters on a side, which makes the holes extremely small on this model. I think this is about the limit of what a filament-type printer can handle, so it is a very challenging test. 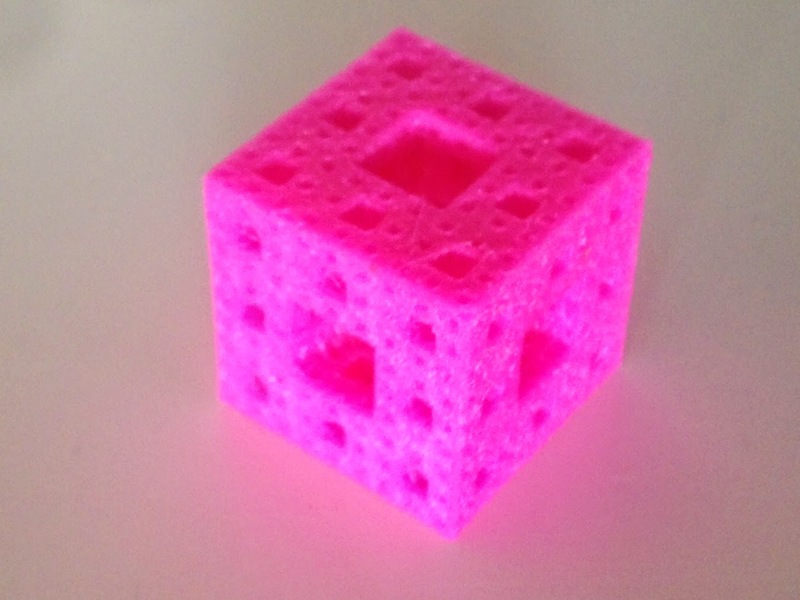 Third place: Next in quality was the MakerBot Mini. The main problem with this model was threading between all of the holes in the model. And there are a lot of holes! The extruder for the Mini seems to have a problem when bridging over empty space; little bits get extruded as the nozzle passes through the space, which makes little spiderwebs across all the gaps. The Mini did a much better job than the Afinia on the corners, but the threading in the small holes is impossible to remove. We cleaned up the threads from the larger holes before the picture was taken. Second place: The Afinia H-Series with ABS was very, very nice. The corners aren't as sharp as on the MakerBots, but the detail came out very nicely, with very clean holes all the way through. And you can't beat the opaque, soft look of the ABS. And the amazing yellow color! A very nice and reliable print; I've printed literally hundreds of these on the Afinias and they work very well. First place: The winner is of course my best friend the MakerBot Replicator 2. I LOVE YOU REPLICATOR 2 PLEASE DO NOT BE DISCONTINUED. Sigh. The picture below is a bit shiny and does not do justice to the incredible sharpness and detail of this model; the top face is most representative. 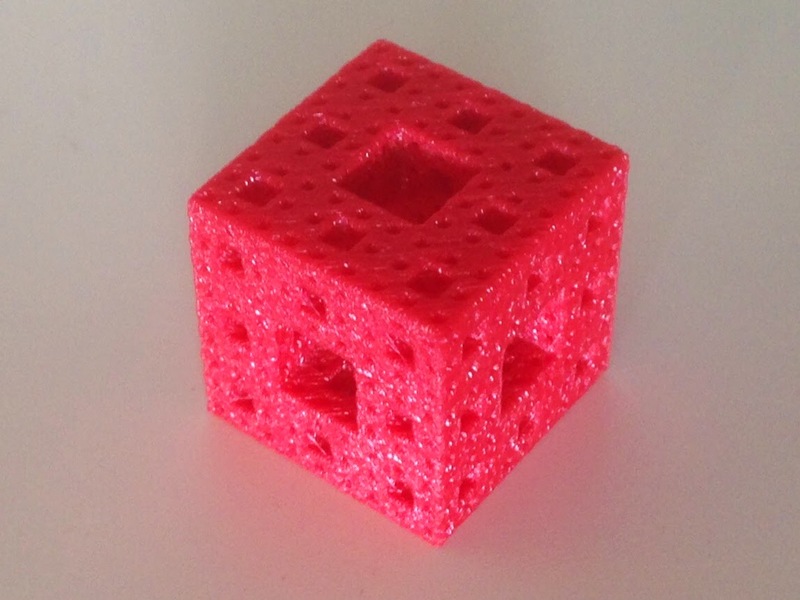 The Replicator 2 prints this model as if it was as easy as printing a solid cube, no worries. 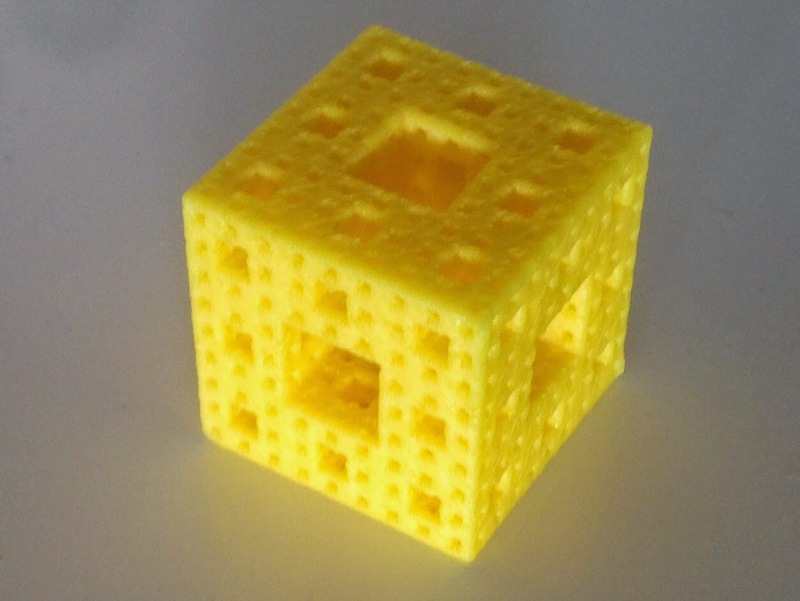 I have a print of a Level 3 Menger sponge from the JMU Engineering Department (thank you John Wild!) 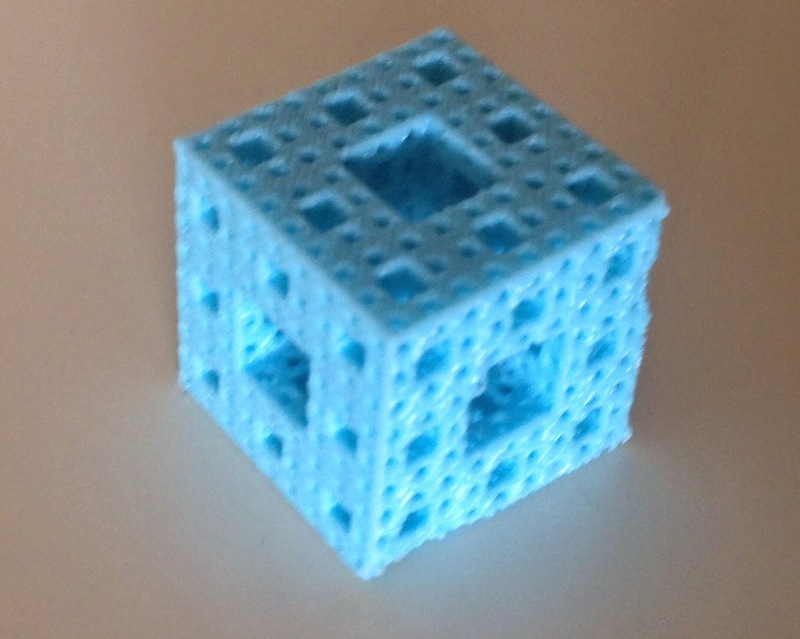 made on a fancy refrigerator-sized Dimension Elite printer, and the Replicator 2 print is just as good. In fact, it's better, since the dissolvable support material from the Dimension Elite doesn't quite get out of the smallest tunnels, while the Replicator model has fully open tunnels because of the way that it printed on its corner; nothing was ever printed in the tunnels, so nothing needs to come out. Super clean tiny holes all the way through and edges so sharp it almost hurts to hold on to the model. Fantastic!